So the steps for curing the man with amnesia are pretty simple. You go to Mong (where they have litromin.) However, in Mong, everyone’s worried about the missing crystal. You’re told that a monster ran off with it to the west. This involves running back through the tunnel and then across the far end of the broken bridge. 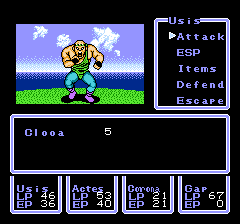 There you fight Clooa who looks like a very confused body builder. 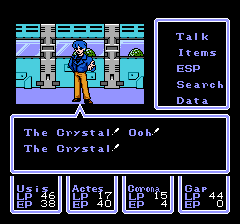 Here's the man that stole the crystal. With the crystal in hand, you can head back to Mong. However, the game seems to have some kind of broken flag. You go to the elder, and she’s still upset about the missing crystal. The guy that used to tell you to go to the Elder if you had the crystal? Now he is thrilled and takes the crystal from you. There’s no text saying that the crystal is gone. Instead, it just silently vanishes from your inventory. A random villager is thrilled that you have the crystal. Then he steals it from your pockets. At that point, an old guy in town thanks you for helping, and wishes you luck in finding the Litromin. Then he gives you the Litromin. 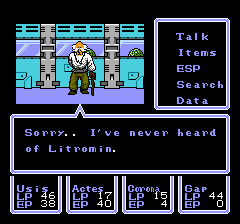 Talk to him again, and he claims he doesn’t know about Litromin. The old man claims that he doesn't know about the Litromin. So, you take the Litromin back to the guy with amnesia. He groans, and then begins to talk. Apparently he knows who Corona is, and expects her to try to stop the monster outbreak. 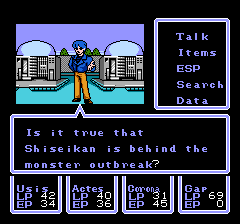 It sounds like Shiseikan may be some kind of rogue AI, but that doesn’t explain why monsters are appearing in space. The summary of the conversation shown here is that he knows Corona, there's a tower which we need to get into, and Shiseikan is in the "bioroid" plant. After this discussion, he’s back to talking about being surprised he’s on the floor.